The wedding is only a month away. With the reception being hosted at our house, the ever shortening timeline to have everything ready has been causing lots of stress. 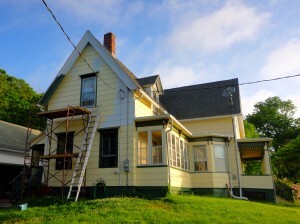 The biggest outstanding project is getting the house painted. Or at least enough painted for the reception. Yesterday morning we decided to both work on painting. Until yesterday, Susanna had been doing the vast majority of painting. I got out the spray gun, and we painted most of the walls. Of course, this still leaves a lot of trim and detail work around the windows to do. But those projects are more easily worked on before or after work in small chunks. The house feels (at least to us) much closer, and the painting doesn’t seem so stressful today. The only real remaining challenge is to find a 32-foot ladder (or taller) to borrow so we can paint the trim on the peaks. We picked the house colors over a two years ago. I wrote about the color choice in April 2011. The colors are Concord Buff for the walls , with Rookwood Dark Green for the trim and Rookwood dark brown for accents. I picked these from the Sherwin-Williams historic Victorian Exterior color palate. I am very happy with how the house is turning out. And I am very thankful that Susanna has the time (and desire, and skill) to do the vast majority of the painting. After we get done with the house, it will be time to get the barns to match. But not until after the wedding. And after the summer. I think we are going to take off from doing major projects this summer. The porch color scheme (Sherwin-William’s Concord Buff, Rookwood Dark Green, and Rookwood Brown). The painting scheme was planned by Susanna. 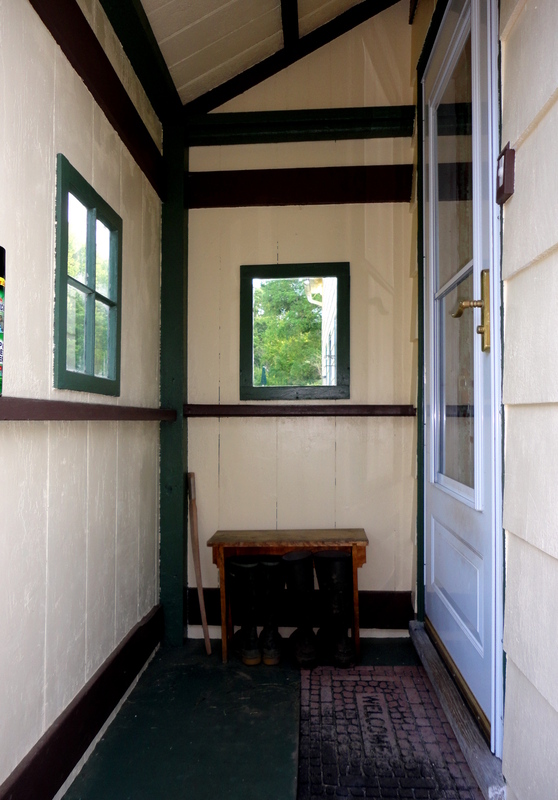 Now we need a new storm door to match. Looking good. I am going to be buying a ladder for our farm in about 2 weeks. If you still need one then, you can borrow it. Thanks, I will keep that in mind. We shouldn’t need the tall ladder for more than a day or two. Hopefully one of my neighbors will have one, if not I’ll give you a call.